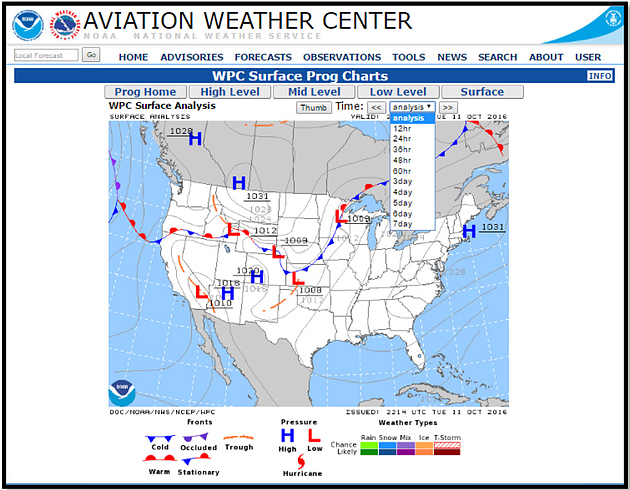 In the world of aviation weather, pilots require advance notice of weather conditions. Unfortunately good advance forecasts are not always possible. I’ve often told pilots that if you’re more than a day out, flight service just doesn’t have good information. Three days out and you may as well look on the weather channel. Now I have a better suggestion: use the Prog Charts. But you must know when the data is accurate and when it is not. This does not require advanced weather knowledge and is quite simple. The Prog Charts go out 7 days. These forecasts are model based and in my opinion frequently inaccurate. For instance, if a cold front is forecast to move over a mountain range, I always look at the speed of the front as it nears the range on satellite or radar. In order for the front to continue its push over the mountains instead of stalling just before the crest it must be fast moving. If it stalls it can sometimes be a day before it moves over the top. In Southern California, where the fronts are typically coming off the Pacific, you must look at the angle and movement of the system and then consider the curve of the coastline and mountains to determine if a system will affect Southern California. And remember that if you don’t see a low or a trough (extended area of low pressure) on the 500 MB (FL180) level in SoCal, there won’t be convective activity (at least about 90%+). Beyond that, here is a way that you can predict in advance if the models are accurate. Step 2: Select Surface and the day/hour of your travel. Step 3: Now then, let’s say it is 7 days out. Take a snapshot of that day’s Prog Chart. For easy viewing you may wish to save it on Powerpoint. Step 4: Each day take a snapshot of the day/ time that you plan to leave and compare it to the previous day’s models of the same day/time. They SHOULD look fairly similar with minor variations. Should the systems or precipitation suddenly look considerably different, you know that the models for this area are off and that the forecast is invalidated. Step 5: At that stage I would phone your local NWS office and ask them to help you determine what kind of weather you might encounter along your route.